The bread loaves look amazing. I am always in awe of beautiful bread. 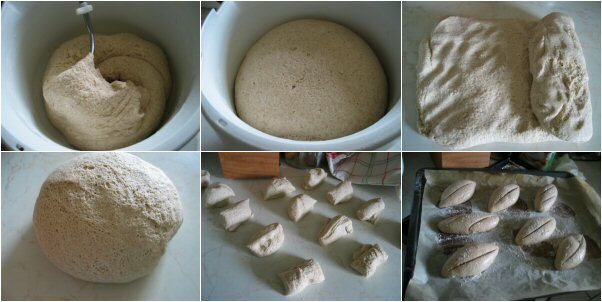 I notice that you used spelt flour a lot, I should try it too since it is so healthy instead of just baking with the usual bread flour or AP flour. These rolls really look so crusty! Great with soup I am sure! Your bread rolls (especially the spelt ones) always look so professional. I'd definitely buy them if I saw them in a shop! Wowo the rolls look perfect i am sure if i make them they won't look half good as yours. Have you thought of becoming a baker?You should!They look so delicious! Prefectly baked cute looking bread rolls..
Yu would have to be a spelt expert by now. When i finally get round to using it I am gonna ask you lots of questions..... beautiful rolls and also cookies and scones .... you rock the spelt world! 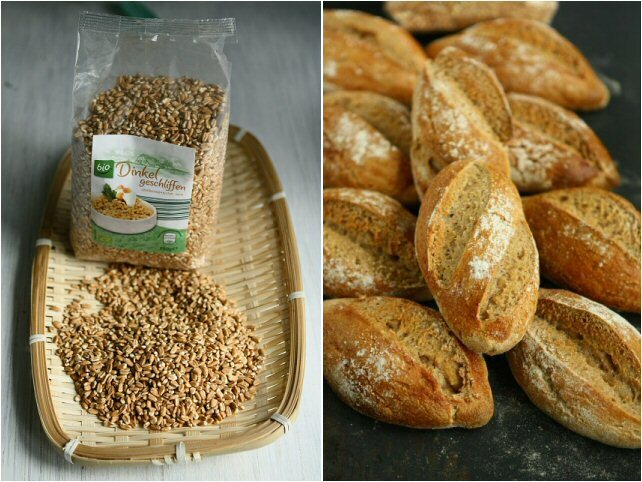 i'm now also leaning how to incorporate spelt little by little into my bread making. Yeah,i find that they do not rise up as high as compared to using just bread and ordinary flour. Your pictures are always so enticing! Splendid breads! They look so perfect. You have such a wonderful talent for bread and these pictures are a great way to showcase that talent. Also, your flair with using different grains never ceases to amaze me. Delicious bread loaves! This size roll makes the most amazing sandwich. Now why am I not a baker.....lovely job as always Angie. Mmmmm... these rolls look delicious! I can just smell them coming out of the oven. I have had trouble with migraines in the past so I was very interested to read that spelt can help them! These are beautiful! I have never cooked with spelt before, but you make it look so amazing. I haven't made bread with spelt before, but I can see it's well worth the effort! Hey, first time visitor here.. Loved your recipes. The shape of bread is just awesome.. Your rolls are gorgeous! So much better/healthier than a bakery. Lovely rolls! I have been looking for spelt grains and flour, finally found the flour, I'm trying to incorporate more grains in my bread baking too. Love your awesome rolls! Those look gorgeous! They'd be perfect for dinner or as a sandwich roll. And I think they look like they rose just fine! I wish you could come here and spread your fairy-baking-dust. These are perfect! Anyway, while I'm here, I'd like to invite you to take part in my upcoming cookbook giveaway. It will be an easy win, no contests, no battles lol and the book is really very cute. I do hope you will participate and add to the fun! Keep a watch for the giveaway which I will launch as soon as my book comes off the printing press, so the winners will be receiving pre-release copies! I must try to make some of your healthy breads. Always look so perfect and yummy. I don't think I've ever tried spelt - I need to give it a shot. Those rolls look crusty and gorgeous - love that you slashed them to make almost mini loaf look-alikes. I want a sandwich on one of these delicious looking rolls! They look picture perfect! These rolls look fantastic, Angie. Perfectly risen and golden brown... just like something I'd get from a professional bakery! Is there anything better than freshly baked bread?! I would love a roll (or seven) spread with unsalted butter. Yummm. Angie these rolls look absolutely fantastic, I could sit down with a glass of wine and a few of these! You are a gifted baker Angie :) Please let me know when you open your bakery so I can come visit! Lovely rolls - they look like perfection. Your breads are always absolutely gorgeous, Angie. So professional looking. And when you said that spelt doesn't have a lot of gluten so don't expect a lot of rise, I was surprised how light and airy the dough looked. I'm sure the texture is quite delicious too. These rolls look amazing - they're so pretty and look delicious! Yum! Delicious these bread rolls and very good for you too. Well done! No way, these look awesome and so professional. I am keeping this recipe to make some day. I love it!! One question, where do you get the fresh yeast? Beautiful! I can't get over the beautiful things you make with whole grains. I'm curious about the refined spelt flour you use though, I can't get that here so I'm wondering if just an all purpose flour would be a good substitute. I love the flavor of spelt though! These rolls are gorgeous, Angie...and I'm sure delicious as well!! The rolls look so lovely like the one just come out from the bakery shop with perfect shape! Just gorgeous Angie. These are stunning looking rolls, and healthy too! WOW!! These breads look stunning and delicious!! What perfectly beautiful rolls, Angie! I would love to make these! This bread looks great! I have to try spelt. Beautiful rolls yet sounds so doable. I adore your variations in using the spelt flour. i love to have that for breakfast.. I have never used spelt to make bread but these miniature loafs look so mouthwatering I wish I had couple of them! Angie, I've been missing all your beautiful recipes and I'm glad I'm admiring these rolls now, they look so professional! The shape of these rolls is so great. The golden, crusty tops look delicious! These look delicious. Thanks for the education on spelt! Sounds like spelt is very healthy. I love your bread rolls, they look perfect. Love the rustic, organic appeal of this bread and the crack on top. I am sure I'd be ready with my favorite jam =) Thanks for sharing. This rolls look SO GOOD! I'm SO envious of your breadmaking skills! Those rolls are so gorgeous! I love baking with spelt flour...it always turns out so tasty. They look amazing. I'd love a roll warm from the oven, with melting butter. These are more beautiful than any rolls I have seen in a high-end bakery. So rustic. I love the shape you made them in too! Yum! I love breakfast rolls! I've never made my own though, so thanks for sharing this! This bread looks amazing! I have never tried spelt, but I’m going to give it a try! You are an incredible baker! I would like to have these breads for breakfast but I don't want to get up 2,5 hours before because of the proofing. At what stage can you put the dough in the fridge so you can bake the bread just before breakfast? Forgot to ask: what is the roastingpan for? water? You do bake the breadrolls on the baking tray with parchment paper? I wish soon I can bake so healthy bread , look fresh and good. Your rolls are nothing short of gorgeous Angie! I didn't know spelt was so good for us! These look beautiful. Love hearing all of the good things that spelt flour can help out with. These are the most beautiful rolls I've ever seen! Good job. Tempting, healthy, and rustic rolls...YUM!. You are really acing bread presentation-awesome. These look professional. I am enjoying your continued use of the spelt grains...I need to gain comfort in using whole grains. Oh Angie, you are the bread queen. These look so beautiful I want to grab some from the screen!!! Oh my gosh! Your bread looks AMAZING!! I'm still very new at baking bread and loaves, but after making my first batch of brioche bread it feels like I can tackle the world! You are a fantastic baker. These breads look perfectly done. These rolls are just perfect!! Love the healthy spelt in them. Another great spelt recipe! Thanks for sharing the benefits of spelt. I swear girl - you make the BEST bread! I have yet to make a bread with a starter. isn't that weird? I have to come back and make this one - it is too mouthwatering for words. These rolls look absolutely perfect! 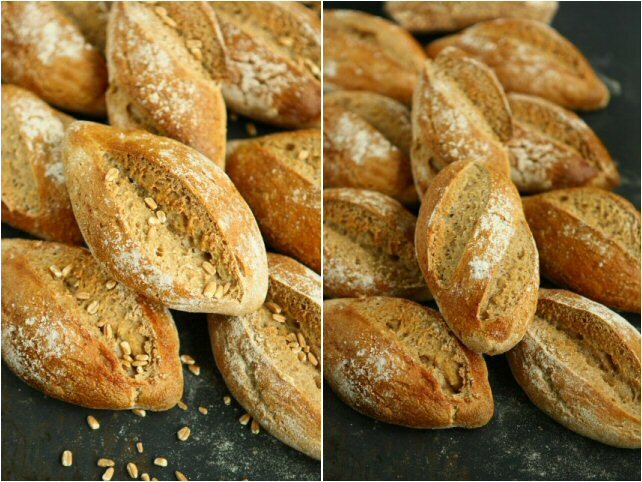 I like the combination of spelt you used, and with now white flour...love these! Beautiful bread! I love spelt flour. Love your recipes with spelt flour. Oh my those look really nice. I will definitely be trying this out for sure! Angie, they look georgeus! :) I love spelt! you truly know the art of baking... look at those perfectly shaped mini torpedoes! I can almost hear the lovely sound of the crunchy crust when pulling one of those beauties apart. In the UK we get it from health food shops, or sometimes a bakery will sell it or give it to you. Some of the large supermarkets with in store bakeries may have it too.